Home Made English Muffins - oh YES! You won't believe how easy this is! 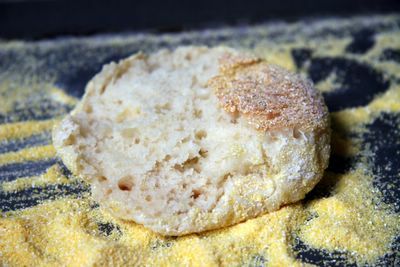 For this post I am indebted to Barbara of Winos and Foodies who, a while back, wrote a post about how simple it is to make English Muffins. It's true - it's amazing! Check out her recipe here. The good thing about non-live media is that you can edit out the bits you don't want anyone to see. Hence, when I wrote my Rachael Ray Post yesterday, I missed out the part where I was ill. I didn't mention that when I arrived at Liberty Cafe I had a splitting headache. I didn't share my idiotic response to the pain - which was to take a couple of my friend's Nurofen Plus containing Codeine, on an empty stomach. I kept quiet when my food arrived, because I had started shaking, my tastebuds weren't working and I started to feel nauseous. Despite having my 'big' camera with me, I didn't even have the strength to take a photo, and I had to recycle a picture from a previous visit instead. Anyone reading yesterday's post had no idea, that I barely even looked at the food before having to leave the restaurant, where I promptly threw up over the side walk (as subtly as I could, of course). I had been so looking forward to that Eggs Florentine all week, but in the end I didn't even have the chance to eat it, let alone enjoy it. Instead I dashed home to spend all afternoon in bed recovering instead. I was so miffed at missing out on my eggy muffin treat, I determined to make some at home on Sunday. It was then I remembered, in the back of my mind I had filed away a memory - a piece of information that recalled Barbara's English Muffin recipe where the mixture had to be made the night before. So that is how, sometime after midnight (and after a cocktail or two), I started making dough. Fred looked at me as if I was crazy. Well, yes, maybe I was. But, remember, this isn't bread, it's a muffin and the procedure is far more forgiving. I popped everything in the Kitchenaid and let it do all the hard work. Once the dough was blended, I covered it with a damp teatowel and retired for a good nights sleep. 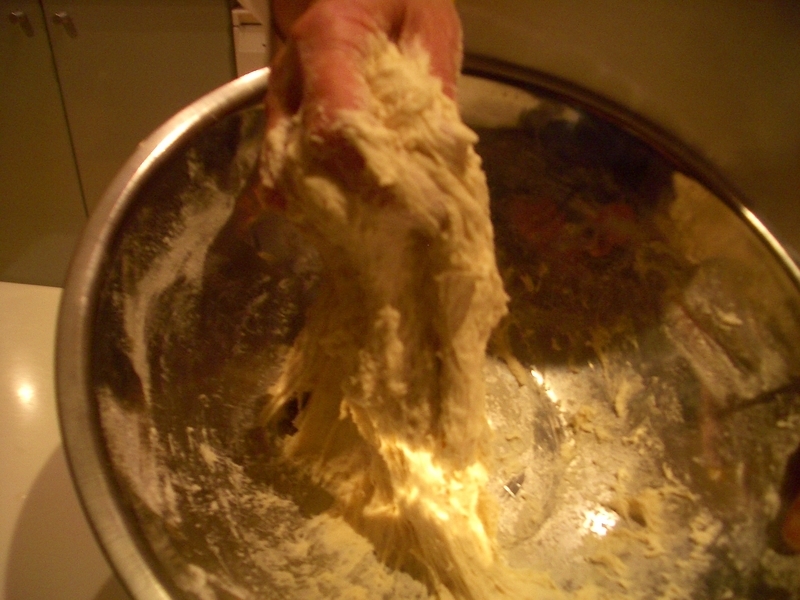 The next morning, I excitedly rushed to the kitchen to check out the dough. It was rising nicely, but it was way too runny. It seemed that I'd taught myself a little lesson: Measuring ingredients after an evening at Olive is probably not the wisest idea. I was certain I could salvage it. I just added some more flour until my dough looked like it was the same sticky consistency as Barbara's. It is quite amazing to think you can cook bread in a skillet over dry heat. It's remarkable. It really did work. My muffins didn't look particularly amazing, but they tasted exactly how a muffin should taste. 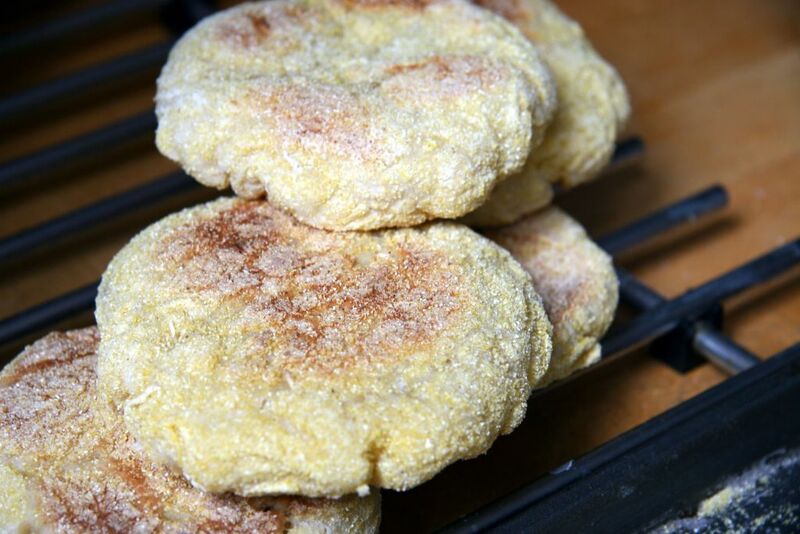 Crispy on the outside and fluffy on the inside. Ummm - they were so good with butter and marmite. 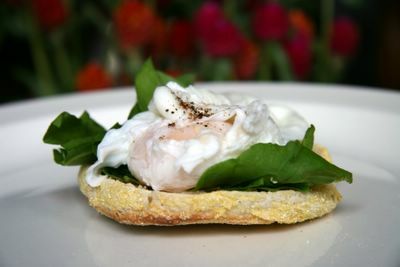 The were even better with a soft poached Marin Sun Farms egg, a handful of sorrel leaves and a crack of fresh black pepper. I skipped the hollandaise. Afterall, some things are just a bit too much effort for what should really be a lazy Sunday morning. I have to partially disagree, I think your muffins do look great! :) And thanks for highlighting Barbara's recipe, I'll head over asap. Oh Sam, those look divine! 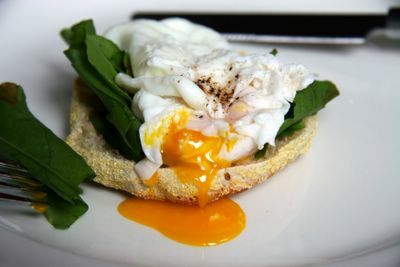 You're making me crave poached eggs ona muffin. Sam, I have a recipe for an easy hollandaise sauce from The New York Times Cookbook (one of my top two most-consulted cookbooks), and would be happy to pass it along. Heat 1/4 pound butter* to bubbling, but do not brown. Into a blender put 3 egg yolks, 2 T. lemon juice, 1/4 t. salt, and a pinch of cayenne. Whir on low and add hot butter gradually. Blend about 15 seconds, or until the sauce is thickened and smooooooooooooooooooooooooooth. *About the butter. This recipe calls for salted, as you can see (by the lack of added salt). I have been cooking for a few years with unsalted butter, because American butters use salt as a preservative and it's usually overdone. But surely there are good salted butters you can use for this recipe, which really does need salt. Unsalted would work fine, but be aware you will need to add salt. This is a dandy little recipe that I've used dozens of times to great success. Thank you both for those recipes. Would Vegemite do in place of Marmite? That's all I have on hand -- er, for next month. oh sam, i hope you're feeling all better now. you know, i never bring my big camera to restaurants. it feels so intrusive. do you ever have any problems whipping out that thing (from staff, or it just being unwieldy?). btw, that runny yolk picture is making me drool. But you are a VERY VERY NAUGHTY GRL, you SHOULD NOT have neurofen on an empty stomach, because the anti propaglandins affect your stomach too and you will wreck your stomach, ok? I love that we're the sort who would scramble to make English Muffins at the drop of a hat! Sam- the recipe specifies high grade flour and regular flour... does that translate into bread flour and AP? Sam - they look great. Yes mixture is quite sticky which was a bit of a worry to me also, but I proceeded as per the recipe and they worked. The recipe is unbelievably easy and thanks should go to Michael Symons wife for sharing the recipe with a magazine. I read your post at 9pm last night and was so persuaded of the ease of making (and decided that my kids would love me if I made them muffins for breakfast (I need to give them reasons to love me at the end of a ten week summer holiday when we're all sick of the sight of each other)). We live in France and decent English muffins are not what the local boulanger does best. They were fantastic and my kids think I'm a genius. I did toast them after cooking though because they seemed a mite doughy on the inside. But toasted they were absolutely perfect. English muffins from scratch? I'm proud of you girl! And the internal crumb (the hardest part to get right) looks perfect. Now you need to make Welsh rarebit to go on them. OK - everyone - McCauliflower pointed out to me this recipe had two flour types. I had no idea. Like I said - I made this after 'some' cocktails - and, well, the dough did turn out runny. Of course- I missed out one entire ingredient. See how forgiving this recipe is! Oliver - I can't wait to see your photo f your version. My photos are a bit blurry unfortunately. We have such bad light (read grey skies) I didn't too good a job. Kate - make one - its easy! Tana - thanks for the recipe. I'll have to try it. As Fred didn't want any (not a breakfast guy) I didn't want to waste s many egg yols on myself either. Next time I'll invite brunch guests! CC vegimite would 'do', but really, marmite trounces it in terms of superiority. Just don't tell Calre from Eat Stuff I said that. Del - I will have to make you some, one day. Dexygus - I don't usually take my big camera out to restaurants either. Only when being a 'real tourist' or at lunch. As I'd been at the market it was slung over my shoulder on this occasion. More often I use my phone camera thse days which take pretty lousy photos but good enough for the blog. Clare - you are right, I am sorry, My head was hurting so I didn't think straight. Barbara - much better thank you - thank you again - and to Michael Symons' wife as well. Best recipe ever! Englishwoman - I am so glad somebody else has made them already. So glad you found them as easy as I did. I have run out of my first batch and wondering when to make some more. SOon! Kevin - hey everyone this is my friend Kevin who lived in SF for 3 years but had to go back to England :( If you were still here I would make you some. And Welsh rarebit too. Now there is an idea! Thank you. Sorry to hear about your being so icky sicky. But you sure rallied 'round with those gorgeous English muffins! I have been meaning to try making them for ages but always forget to. Now I am totally inspired. When I was a kid we would use toasted English muffins (store bought) instead of hamburger buns; they were so much more interesting. I can't wait to try a homegrown burger on a homemade English muffin! (Like now would be good.) Thanks for this great post. I'm a huge English muffin person..probably have 2 a day, and am now inspired to make my own. Thanks for the tip! Oh Sam, your muffins just look irresistible! Greetings, my friends. Do you like cooking? Do you enjoy preparing a healthy and tasty meal for your family? It means we have something in common.